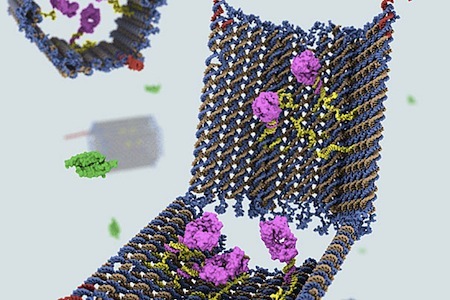 A robotic device made from DNA may one day be released into the body to find specific cell targets and then deliver molecular-based instructions to self-destruct. The device was developed by researchers at the Wyss Institute for Biologically Inspired Engineering at Harvard University. Science fiction fans have already been exposed to this idea. In his 1967 novel These Savage Futurians, Philip E. High described a "constructed micro-organism" to fight it out with viruses and bacteria. "This object, strictly speaking, is a constructed micro-organism about the size of Hartman's virus. It is molded from special plastics, the molecules of which have been atomically arranged for durability in these conditions." He paused and almost managed a smile. "It is also a warrior robot." Again he paused and drew a deep audible breath. "Impressed on the recognition tapes of this robot is a picture of the _Metricitus spirochaeta!_" He walked over to the picture and pointed. "This pointed tube at the front of the robot is a contact device. It is designed to release on contact with the spirochaeta a lethal charge of electricity electronically restricted to a nervous system, or it you prefer it, the substance of the hostile microorganism." He turned to Judith and said, gently, "Have you followed me?" "Yes, I've followed you." She looked puzzled. "Judith, this auto-factory has produced sub-microscopic robots in hundred of millions. I propose injecting a few million into your blood stream in a special solution and letting them seek out and destroy the spirochaeta which are causing your illness. From Harvard; thanks to Winchell Chung for contributing the tip and reference for this story.